BridgeValley Community and Technical College is pleased to provide currently enrolled students with short term counseling and referral services while enrolled at the college. Counseling services are free of charge to BridgeValley students. Counseling sessions consist of a short-term basis (9 sessions per semester). If it is determined that long-term mental health counseling services are more appropriate to address your need(s), the BridgeValley counselor will provide a list of community resources. Counseling appointments are made in one-hour increments. The actual length of time for a counseling appointment is 45 minutes. This allows the counselor time for documentation of the previous appointment, and for centering before the next appointment. According to Ulifeline.org, suicide is “the act of deliberately taking one’s own life.” Suicide is also the second leading cause of death among college students. 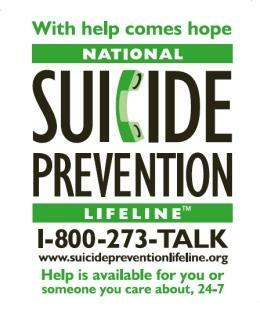 Suicide is a very serious subject and is preventable. The following are some of the warning signs of suicide: talking about wanting to die or kill oneself, talking about feeling hopeless or no reason to live, increasing the use of alcohol and/or other drugs, anxiety, agitation, sleeping too little or too much, showing rage, extreme mood swings, and others. Most people that attempt/commit suicide have an underlying mental health concern such as depression, anxiety, or substance dependence. If you or someone you know is experiencing some of these symptoms, BridgeValley is here to help! Crisis text line - text START to 741-741 for confidential crisis help 24/7.